Kombucha is one of the most popular health trends of the moment. It’s essentially green and or black tea fermented with sugar (from various sources, including cane sugar, fruit or honey). This fermentation process creates colonies of good bacteria and yeast It contains a colony of bacteria and yeast, commonly known as a scoby (symbiotic colony of bacteria and yeast), that are responsible for the touted health benefits. After fermentation, kombucha becomes carbonated and contains vinegar, B vitamins, enzymes, probiotics, anti-oxidants and a high concentration of acid (acetic, gluconic and lactic). While black tea does contain antioxidants without fermentation, research shows that the fermentation process of kombucha creates antioxidants not present in black tea, like glucaric acid which is thought to help reduce cancer risk. These ingredients are the reason Kombucha has been touted as a nearly magical beverage. 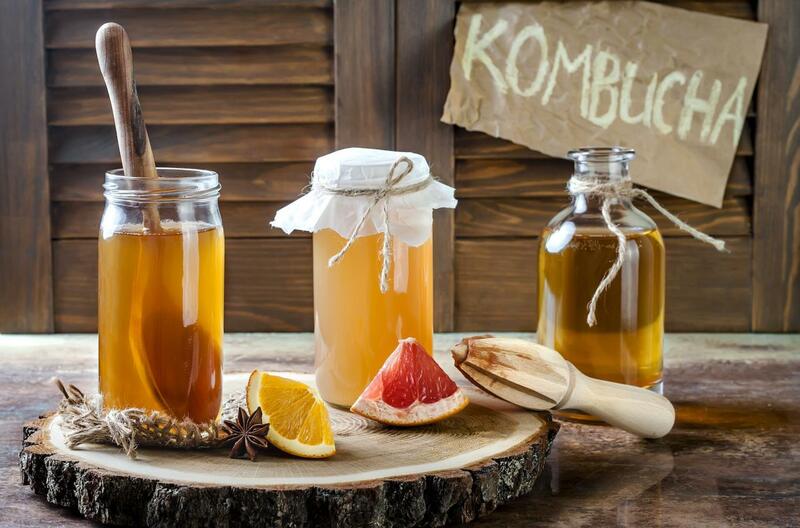 Although many of the health claims attributed to Kombucha consumption are unsubstantiated or over exaggerated there are some definite health benefits. The enzymes and pro biotics are good for gut health, helping to break down food and nutrients and improving gut flora. This can help with digestion issues and improve nutrient absorption, immunity, metabolic function, and cognitive function. The antioxidants are also helpful in boosting immunity and slowing the aging process. That said, you can find these ingredients in a host of other foods like fruit and other fermented foods like kefir, kimchi, miso etc. And the potential downside to kombucha is that it is high in calories and does have some sugar in it. Be aware that it can have some caffeine content (from the tea) and alcohol content (from the fermentation process). Although it is very little, but if you are sensitive to or trying to avoid one of the above I simply want you to be aware of it so you can make the best decision for you. And, if you struggle with conditions like sibo it can exacerbate symptoms like acid reflux, heartburn, and possibly irritate ulcers. The key to effective consumption of this beverage is less is more. To get the benefits without any of the potential downsides don’t consume more than 3 to 5 ounces daily. Max. Or 12 ounces or so (on soda can of fluid) every several days. Last, it’s important your Kombucha is from a safe and reputable source so you don’t get any contamination. I personally like the GTS Synergy brand and Health Ade Kombucha. Is Your Workout Breaking You Out? Many women tend to think that protein powders are for body builders only, (people who want “gains”) but this isn’t the case. Clean protein supplements make a great healthy snack and have plenty of health benefits.